Tenzin Choegyal is a Tibetan artist, composer, activist, musical director and cultural ambassador. Born to a family of Tibetan nomads, Tenzin Choegyal was forced into exile in India as his family fled the repression in Tibet. As a child, Tenzin would listen to his mother singing in the nomadic style and he attributes much of his passion for that genre to her early influence. 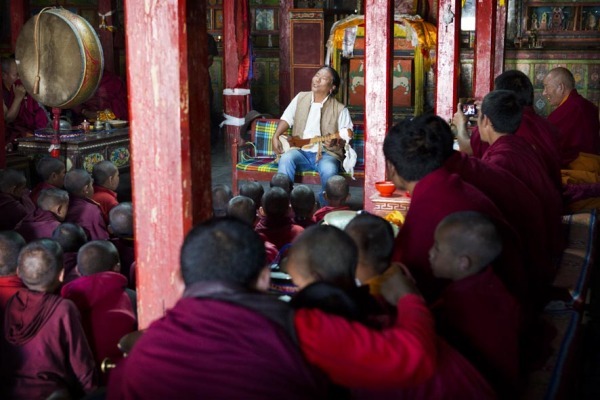 Tenzin channels the wisdom and traditions of his ancestors through his songs. Over the years, Tenzin has a successful international career as a musician, playing at such prestigious events as WOMAD as well as several Concerts for Tibet House at Carnegie Hall, New York. In addition to his much loved solo performances of soaring vocals and circling rhythms, Tenzin is an avid collaborator with musicians from diverse cultures,traditions and genres. From classical western (with chamber orchestra Camerata of St John’s), contemporary (with Philip Glass) to ancient traditional (with didgeridoo master William Barton), Tenzin embraces opportunities to take his music to uncharted territory both in the studio and on stage. Tenzin has six independent album releases and recently collaborated with Philip Glass on the breathtaking score for the film ‘The Last Dalai Lama?’. With Laurie Anderson, Tenzin is now working on an interpretation of the Tibetan Book of the Dead which is due for release by the Smithsonian Institution in the coming months. In 2008 Tenzin founded the annual Festival of Tibet in Brisbane, Australia, which showcases Tibetan culture through music, film, art and discussion. He was musical director for the Asia Pacific Screen Awards in 2011 and 2013 and is artistic director of the Brisbane Himalayan Film Festival. In 2015, in his role as ambassador for the Australian Himalayan Foundation, Tenzin travelled to the border of Tibet on the Nepalese side, the closest he has ever come to his ancestral homeland. Tenzin was musical director for the Asia Pacific Screen Awards in 2011 and 2013 and has written and performed soundtracks for numerous TV shows, films and documentaries. Through his music and cultural activities such as the Brisbane Festival of Tibet, Himalayan Film Festival and Women with Wisdom concert series (Sydney Opera House, Federation Square) Tenzin shares the Tibetan story of what it really means in being human. 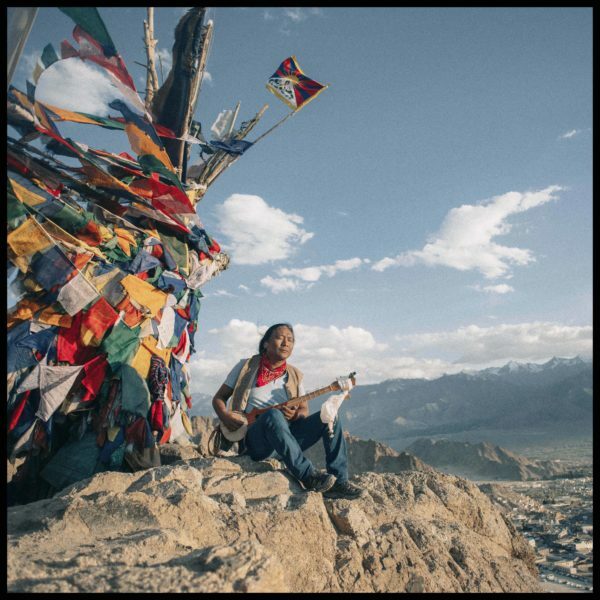 Singer songwriter Tenzin Choegyal draws on his Tibetan roots to create original compositions which uniquely express his cultural lineage and the contemporary challenges faced by his people. Tenzin was born to a nomadic family in Tibet, escaped the Chinese occupation with his family in the early 1970s and was raised in a Tibetan refugee community in Dharamsala, India. There, where His Holiness the Dalai Lama actively encourages his people to preserve their culture, Tenzin first began to explore his musical talents. Tenzin feels a particular connection to the music of the wandering people of his homeland. He recalls his father’s mastery of the lingbu (bamboo flute) and his mother’s beautiful singing, and attributes much of his musical passion to those early influences. Tenzin’s award winning songs have found a place in the complex tapestry of global sounds while collaboration with numerous Australian and international performers have allowed him to experiment with rhythm and structure and challenge traditional Tibetan musical norms. Tenzin Choegyal plays the Dranyen (Tibetan lute) and Lingbu (transverse bamboo flute). His most outstanding instrument, however, is his voice. His music has been described as beautifully evocative, healing, and transcendent. Tenzin Choegyal offers a thoroughly enjoyable workshop which explores the Tibetan style of vocal projection and spans a range of techniques unique to his musical lineages. He draws his inspirations from the wandering storytellers who performed musical parables and homage songs and shares this knowledge of stories told through songs, while leading participants on a musical journey from the joyous to the contemplative. Tenzin will also share his knowledge in Mantra singing – energy-based sounds which produce vibrations within the universe – was revered as a powerful tool for meditation. The word “mantra” is derived from two Sanskrit words – man meaning mind and tra meaning “to protect or to free from”. Come along prepared to sing your heart out!